When Walt Disney was at his best, his movies worked on many levels. As family entertainment, they were brilliant. But the subversive themes and winks to the adult audience were there too, and this Disney art by Heather Theurer is in the same vein. Theurer’s work is etherial. Kind of scary. 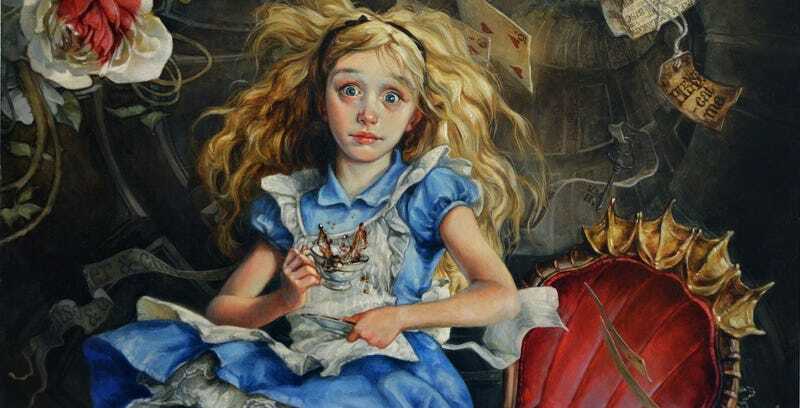 At WonderCon in Los Angeles this weekend, she’s debuting a brand new piece based on Alice in Wonderland. It’s called “We’re All Mad Here” and we’re excited to debut it. And here are a few other pieces of Theurer’s work, which is all officially licensed by Disney. Prints of these will all be available for the first time at WonderCon’s booth #2016. Find out more by following Theurer’s website.